After finding all of the parts that were left of the stock IHI RHB5 turbo from the RS, I needed to get it repaired or replaced. 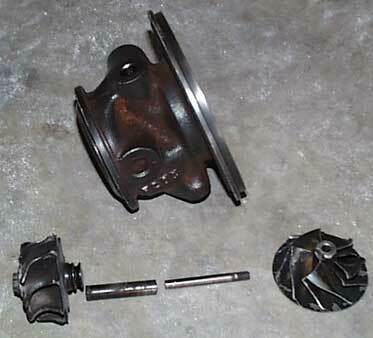 The turbo shaft had broken in half, and also broken clean off of the turbine. I started calling around and found out that it would cost me a minimum of $800 just to get it repaired and rebuilt, or $1900 to replace(and the local Isuzu dealer- McCloskey Isuzu - actually had one in stock!). I was starting to get discouraged at that point, as my cheap find was gonna start adding up. Well, I started doing research and educating myself about turbo technology and learned that I really only needed was a replacement Turbo Cartridge instead of the whole turbo. I found out that IHI made turbos for many cars in the '88-95 years, so it was just a matter of finding out which ones used the same cartridge. I called around to a bunch of places to get some prices. . .they all averaged around $300-a lot better than $800!!! Then I did a search on Ebay and found them pretty darn cheap. 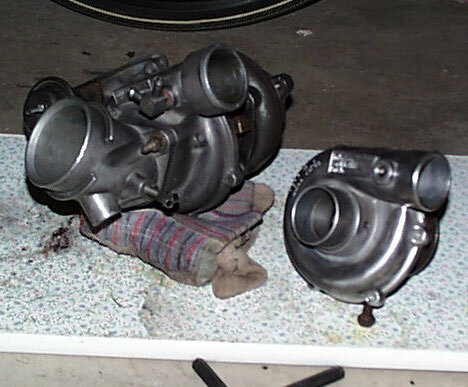 I got 3 turbos in excelent shape-all for less than $150 each. One of the turbos that I got was from the Ford T-bird Turbocoupe, I discovered that it has a larger compressor wheel (.48 trim)--WhooHoo! The Ford Turbo was capable of 381CFM whereas the stock RS turbo is only capable or 200CFM. I disassembled the Turbine housing from the turbo, then took my housing and bolted it right on. . .it was a perfect fit. No machining needed! Note: To get the turbine housing off, you may need to use a propane torch. Heat up the Turbine housing evenly-not the center cartridge- for abour 5 minutes, The idea is to expand the turbine housing without expanding the cartridge inside. Tap it lightly with a hammer and it will slide right off. Make sure you disconnect the Wastegate actuator first, so that it doesn't get in the way. You can see the difference between the Ford Thunderbird compressor housing and the stock RS compressor housing. I have to do some custom plumbing to make it all fit together, but that should be the easy part. 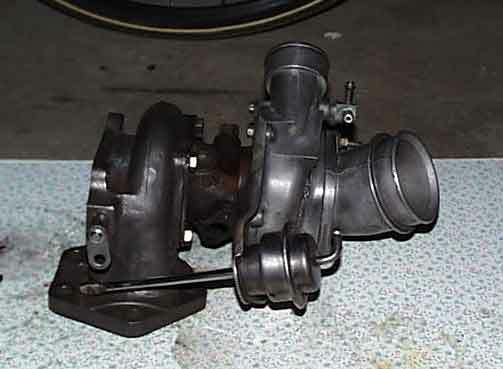 Here is a comparison of the Stock Impulse RS turbo (Left), Saab T3 turbo (Center), and the Garrett T3/T4 turbo (Right). The Tbird turbo would be between the RS and Saab turbo for comparison. After any mods to your car, you should take care to insure the car's safety. A personal injury could happen if there were mistakes when doing any mods. A San Diego attorney may be able to assist you with any injuries incurred during an accident.